These shows, often made up of top New York musicians (those available for a given show), give each performance it’s own unique quality. Indeed, the presence of Napoleon Murphy Brock on sax is a real treat (I mean, Eric Dolphy may have inspired me to pick up the sax, but it was Brock that kept me playing due to his overwhelming enthusiasm and joy of the instrument). Thanks, UrbanG, for the info above. Ed & Band are worth the trip, but throw in Nappy and it’s becomes the place to be in New York that night. third time seeing Ed this summer alone! Am I becoming a Palermo groupie?! What are you talking about, Hugh? “Eddy Loves Frank”, not you! Let’s admit it, here and now, Hugh, we’ve both got “reed envy”! Eddy has a better chance with me, Frank can no longer return the love like I can! Well, there is the very slight chance that Mr. Palermo could indeed be a necrophiliac–though judging from what others have said about him–he is a man of true character and intentions who would never even think of such a hideous idea, let alone carry out such a monstrous deed! Sorry! 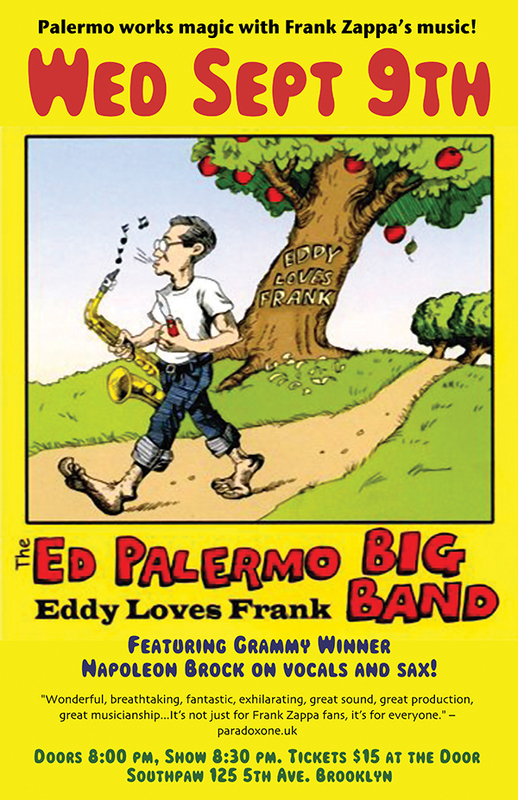 You are reading Ed Palermo Big Band @ Southpaw (feat. Napoleon Murphy Brock) which was posted on Monday, August 31st, 2009 at 9:44 pm by urbangraffito. This entry is filed under Alumni, Frank Zappa, Music, YouTubery.